Describe how the SLDS Data Table and Form components work. Let’s face it, web applications aren’t that exciting unless they contain some data. 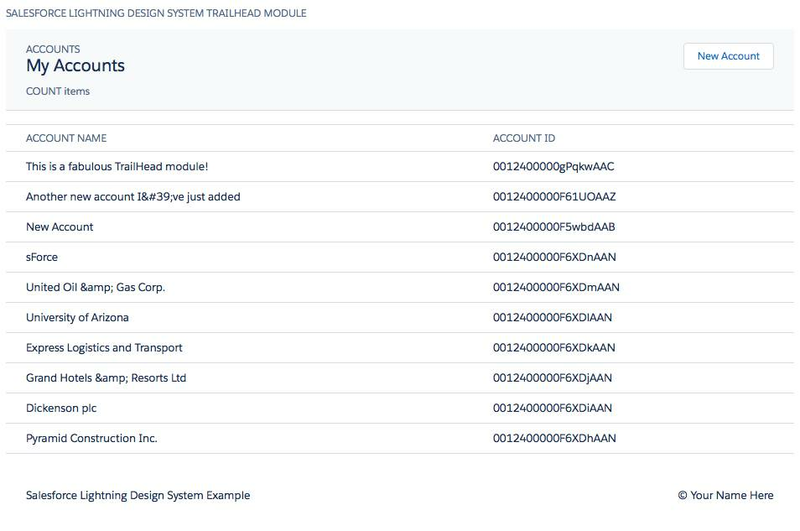 This unit is all about making our list view real and populating with some sample data from your developer org. The Data Table component is an enhanced version of a HTML table for displaying tabular data with the Lightning UI styling. A Data Table is created by applying the slds-table class to a <table> tag. Use the slds-table_bordered class to apply a border. Here is an example table with two columns, and a header row. You can see that its familiar HTML markup with the Design System classes applied. Again no CSS anywhere to be seen. Don’t worry about typing it in, in the next section we’re going to dynamically populate a real Data Table with Salesforce data. As we noted above, in this release the Design System doesn’t support built-in Visualforce components — the <apex:*>, <chatter:*> and other components you know and love — for laying out pages and accessing data. That’s important to note. Don’t expect to apply the Design System to your legacy Visualforce pages and have them instantly transform into the most beautiful UI on the Internet. This code accesses account records via a Remote Object, and the updateOutputDiv() function uses them to render a table within the account-list <div>. Note how the table is wrapped in a div with the slds-scrollable_x utility class. This will give the table a horizontal scrollbar if the data is too wide to fit on the screen. Preview your page and it should look something like the following. Hopefully you are more creative with your account names though. Again there’s a lot of new markup here. Lets review it step by step. The form markup is wrapped into a <div> wrapper to add page structure. Now we discover another Design System component: the Form. The Design System provides styling for several form layouts including horizontal, stacked, and compound. In this example, we apply a vertical stacked layout to the <form> with the slds-form_stacked class. Inside the form is a second wrapper element, a <fieldset> with three classes: slds-box, slds-theme_default, and slds-container_small. These three classes create a white, boxed, small, area to keep things visually nice and tidy. The title in the <legend> tag adds a title at the top of the box. The <legend> element's id attribute corresponds to the aria-labelledby attribute on the wrapper <div> element for accessibility. Each label and input pair are placed within a wrapper div with the slds-form-element to provide optimal spacing. Inside the wrapper, the <label> element has a slds-form-element__label class. The <input> field is placed inside another wrapper <div> with class slds-form-element__control , again to provide optimal spacing. The <input> field itself has the slds-input class. 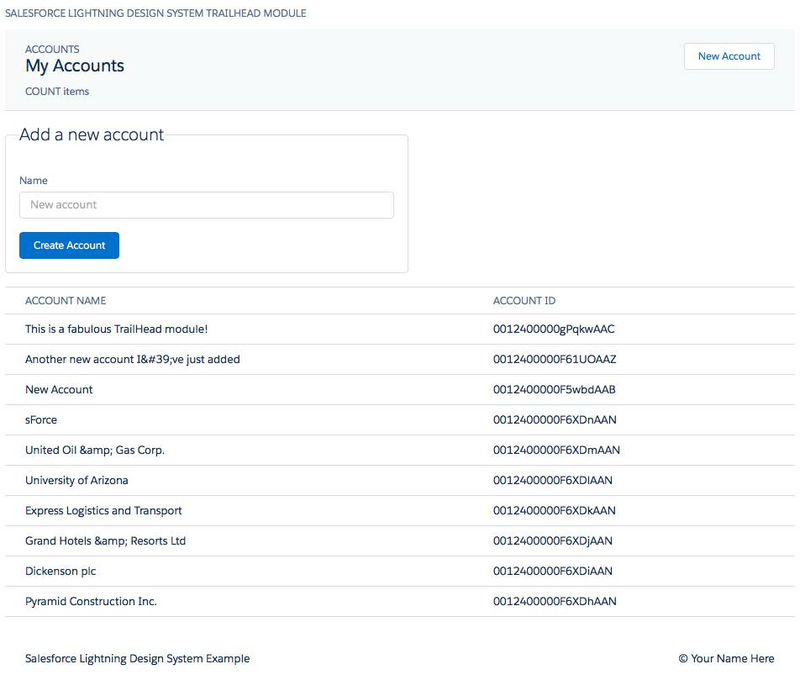 Adding all this markup and classes around your form applies all the Lightning styling (almost) auto-magically. You add the classes, we provide all the CSS. Let’s not forget that the user has to be able to submit the form. Hence we include a <button> with classes slds-button, slds-button_brand, and slds-m-top_medium. These should be self-explanatory by now. If not, please consult the linked docs. Submitting the form calls the createAccount() function which does the honors of calling our Remote Object to create a new record. That was quite a unit! If you got everything working, take a quick moment right now to do a victory lap. Seriously, you deserve it! In this unit, we learned about the Data Table and Form components and then wired them up to real data using Remote Objects. However, there’s something missing here isn’t there? We’ve got a table with the Lightning styling, but it’s a wee bit drab. The page is really in need of some icons and images to liven things up, don’t you think? In the next section, we’ll give it the Design TLC your page deserves.